Changes will include a new office building to accommodate public tours and facilitate the adoption process; adding storage shelters to protect hay; constructing a roof over the trimming chute area; installing wind screens along the west side of the facility; placing protective shelters in the sick pens; redesigning the preparation area to improve animal and employee safety; and replacing worn or damaged corral panels. 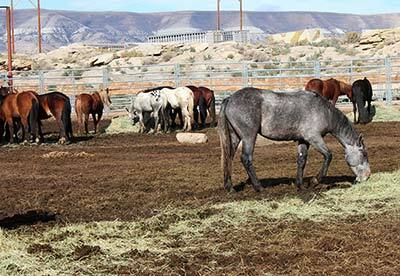 These projects will be phased in throughout the year and should not impact the wild horses. The facility remains closed to allow wild horses recently removed from the Adobe Town, Salt Wells Creek and Great Divide Basin herd management areas to acclimate to their new environment. No public tours will be conducted during the closure; however, the public viewing kiosk is open. The public will be notified when the facility reopens.